Monday’s mini snow storm serendipitously coincided with a day off from both school and my family’s various ski programs. We woke to a few inches of perfect fluff covering the trees and car and driveway, with snow still sifting steadily to the ground. A few inches constitutes a powder day in my kids’ minds, so after breakfast we made our way along snow-greased roads to the mountain. I spent the next few hours chasing my kids around the familiar ski trails of my own childhood, and I couldn’t help pondering the progression of my skiing life – from New Hampshire to the mellow hills of college days in upstate New York, then the deep snow and steep skiing of Colorado, and finally home again to continue the cycle with the next generation. In Colorado, I worked in a ski shop a few steps from the base of the main chairlift. My bosses were skiers, and they scheduled shifts so that all employees had a ski break every day. It was during my five years in Crested Butte that I learned the “No friends on a powder day” rule. You could make plans, but if someone didn’t show, there was no waiting around; it’s every skier for herself when the getting is good. A powder day there, whether interrupted by work or not, generally included laps on the Headwall or North Face, searching out new lines and fresh tracks each run, and recounting the day’s best turns over a couple of beers with friends. I remember skiing one perfect, snowy day without stopping to eat, run after joyful run of deep snow and sweet turns, skiing until my legs were jelly. At day’s end I was exhausted, but happy, fulfilled. In my first winters back East the occasional storm brought a gift of knee-deep powder and soft bumps, a respite from the harder, groomed, manmade stuff. If I could sneak away from work, I would spend an hour or two skiing off the Zoomer chair, short, steep runs as familiar as my own back yard. Sometimes I’d run into friends in the lift line, and we’d ski together for a while. But the no-friends-on-a-powder-day rule stuck: there was no waiting, no adjusting to others’ work schedules. And whether it was a stolen hour or a full afternoon of skiing, I left the mountain with that same feeling of happy fulfillment. Fast forward a few years, and I found myself with three young children, who I was determined would be skiers. Raising skiers is not for the faint of heart. It starts with years of bundling awkward toddlers and preschoolers into layers of sometimes uncomfortable clothing, coaxing small feet into rigid ski boots, schlepping skis from the car, and getting everyone’s boots into bindings, goggles and neck-warmers properly adjusted, mittens tucked into sleeve cuffs just right. Pockets filled with chocolate and the promise of cocoa breaks provided extra incentive if needed. But there were meltdowns, of course, sometimes from tired little skiers; sometimes from the skier mom longing for the bigger runs beyond the pony slope. Back then, I managed to sneak out once or twice a winter to ski with friends on longer, steeper, snowier terrain. On those rare occasions, the old no-friends rule went out the window. I welcomed the kid-free companionship of friends on the chairlift, and we weren’t above taking our own cocoa breaks if the wind was too cold or the lift line too long – or we simply wanted to sit and talk. More often, though, I spent my skiing days with the kids as they honed their skiing prowess. We spent countless hours exploring kid-sized glades and hucking little airs in the mini park. I have a video of my 3-year-old son cruising down a beginner trail in a power wedge, then veering toward the woods near the bottom. “I want to ski powder,” he said, as he shuffled through an inch of fluff atop the groomed surface of the flats. Nature or nurture? I don’t know. Probably a little bit of both. Gradually, the kids progressed to longer, steeper trails, the tight glades at the top of the mountain, hiking over the saddle for further exploration of hidden places, a faster skiing tempo. These days I don’t often get to ski with my kids. The older two have embarked on their first year of race training, skiing with their coaches all weekend and learning how to carve fast, smooth turns into hard snow. The younger one is in a group of more than two dozen of the littlest would-be ski racers, which I help coach on weekends. This all means lots of skiing for each of us, just not together. So Monday was a treat, an unscheduled day to do whatever we liked, and we like to ski, especially when there’s fresh snow and no overlying agenda. I ran sweep on each run, watching the kids negotiate soft powder interspersed with rigid hard pack, then making my own turns behind them. The pace is slower than it was during my Colorado powder days, but considerably faster than that not-so-distant time spent on the pony slope. My skiing company Monday was a ski mom’s dream come true, and the thrill of skis through snow just as happy and fulfilling as ever. Original content by Meghan McCarthy McPhaul, posted to her Blog: Writings From a Full Life. This essay also appears as Meghan's Close to Home column in the January 22, 2016 edition of the Littleton Record. If I concentrate, I can almost block out the roar of the snow guns, which are spewing manmade snow beneath an uncharacteristically bluebird New Hampshire winter sky. Soft as silk, the snow sifts to the ground, building cover on the snow whales, which rise like cresting waves in a perfect line down the hill: swelling white whoop-de-dos that offer up continued freshies, last run’s tracks filled in again in the time it takes to ride up the chairlift. The bottom layer of manmade is incredibly grippy underneath the top layer of fluff, the combination of firm base and fake pow like some other version of hero snow. I push off down the steep trail, chairlift to the left, tree line to the right, goggles down, zipper up against the subzero chill, the bliss of sleek turns bigger than the blaring of the guns. Western skiers would scoff at this zest for manmade snow. I know; I lived and skied among them for five long, lovely winters. I moved west after college with a lifelong ski buddy. We’d grown up together as ski racers on the blue ice and manmade granular of a New Hampshire mountain, in an era when ski racers weren’t encouraged to ski anything other than hard pack. Early in our first Colorado winter, we hiked out to Crested Butte’s Third Bowl. The snow was waist-high, and we hadn’t a clue what to do with all that powder. We flailed. Then laughed. Then floated as we figured it out. She’s still out there, skiing the deep stuff, while I’m in my 15th winter back East. Turns out you can take the girl out of New England, but she just might come back to the mountains of home, despite the discrepancy in annual snowfall between there and here. Manmade snow is an Eastern skier’s lifeblood, a necessity that allows us to carry on down the ski slopes, even if the grass is still poking through the shallow layer of white on the front lawn. Even in a season like we had last winter, where it snowed lots before Christmas, we relied on the manufactured stuff to keep skiing through a late-December rain, holding on until winter returned with a welcome and persistent vengeance. Thankfully, manmade snow has come a long way since ski areas started lining the slopes with snow guns a half-century ago. This is not your grandma’s manmade snow. It’s soft and creamy and carve-able. I know it’s not the real stuff, the deep powder of a skier’s dreams. But with a start to winter like we’ve had this season, I’ll take manmade bliss over the alternative of no skiing at all. And while this is no powder bonanza, the skiing is good. With the super cold temperatures early this week, ski areas all over the region fired up the guns, blowing their own version of cold smoke. My last powder day was Easter, the flakes falling fat and fast on the kids as they hunted Easter eggs. 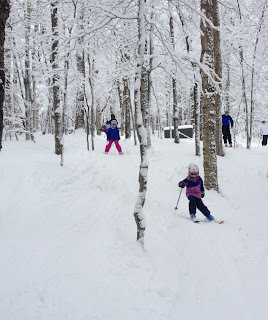 That April storm was a surprise, and we took advantage by heading out for a post-egg-hunt family ski day, introducing our third-generation Cannon kids to a favorite, slightly off-piste, not-entirely-secret stash. The kids whooped as much in delight of the new snow as in discovering an old trail through the woods, an adventure that is a local skiing rite of passage. True to their New England roots, my kids love a good snowfall. Even a dusting of new white has them rushing out the door to sled or shovel or brush snow angels into the fluff. A mere couple of inches, in their minds, constitutes a powder day and has them clamoring to get out on the hill. And true to their New England roots, my kids are not thrown by having spent the first month of this ski season on purely manmade snow. Any day skiing is better than a day not skiing, whether powder or frozen granular, come rain or wind or snow or ice or, sometimes, cold sunshine. I don’t know when the next powder day will be. Until then, I’m taking what I can get: a man-made blizzard, and the occasional face shot under the guns. Original content by Meghan McCarthy McPhaul, posted to her Blog: Writings From a Full Life. This essay also appears as Meghan's Close to Home column in the January 8, 2016 edition of the Littleton Record.